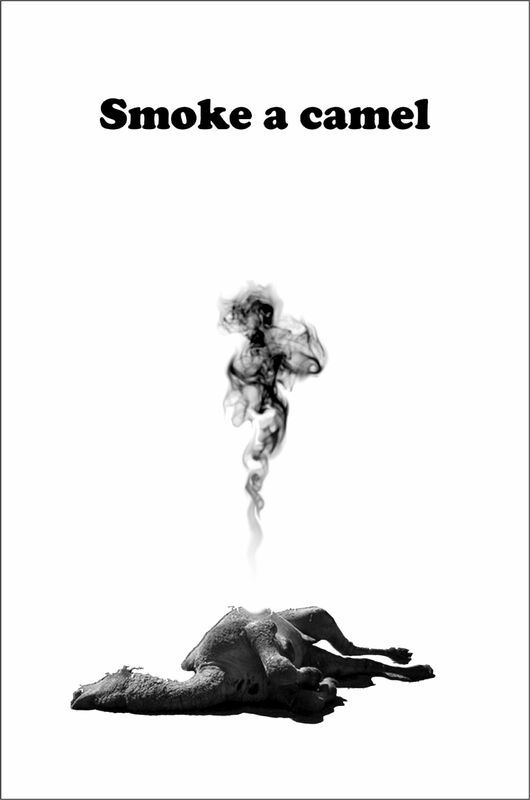 “Where’s there’s smoke, there’s fire”, the old saying goes. Smoking is a lot like Russian Rollette. You know there’s a bullet in there. But you’re gambling that it doesn’t have your name on it. It’s a hell of a gamble. 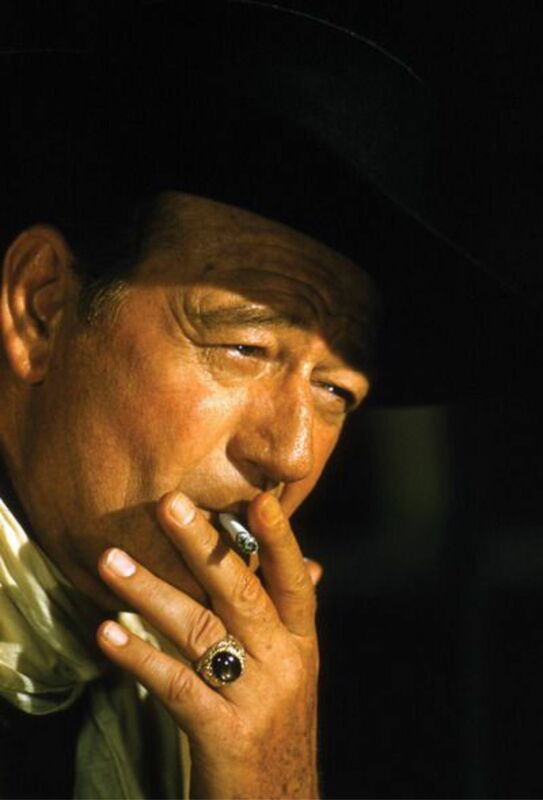 A gamble that John Wayne lost. 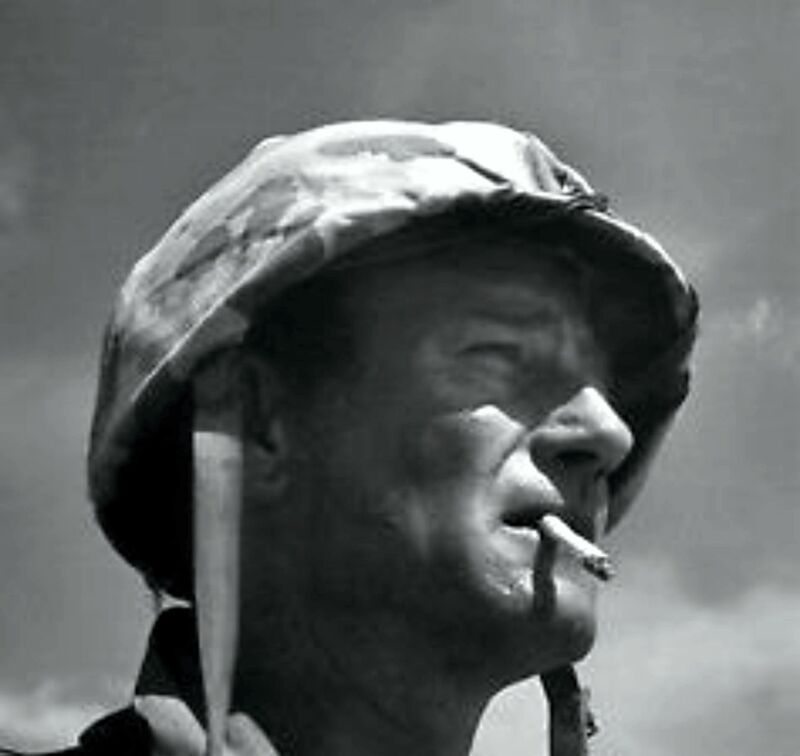 John Wayne’s smoking exploits are as Legendary as he is. I’ve seen several different claims as to how much he smoked: 4, 5, 6 and 7 pack of cigarettes a day! Most claim 6 packs a day. 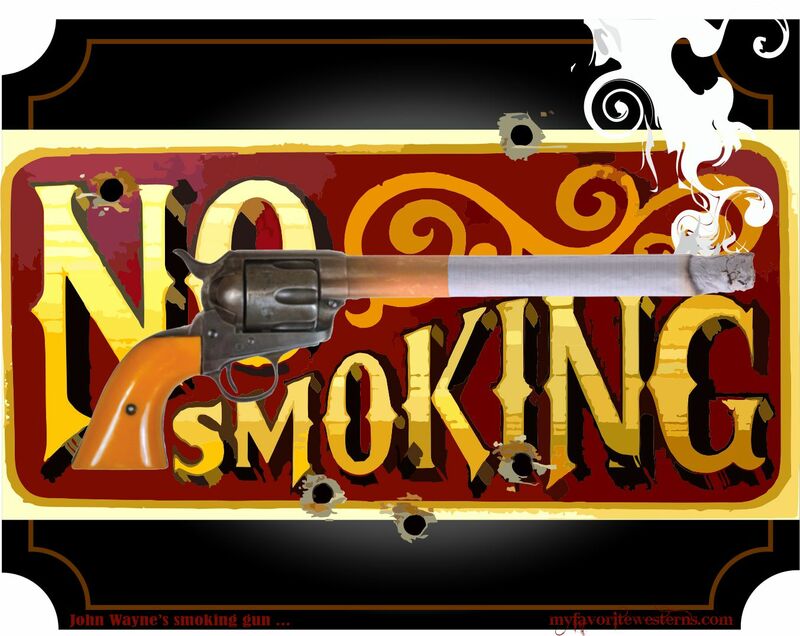 I refuse to believe 7 because 7 packs of cigarettes a day is 7 x 20 cigarettes = 140 cigarettes in a 16 hour day (8 hours for sleep) – or 8.75 cigarettes an hour – which would be smoking 1 cigarette about every 7 minutes. That seems impossible. Even for John Wayne. 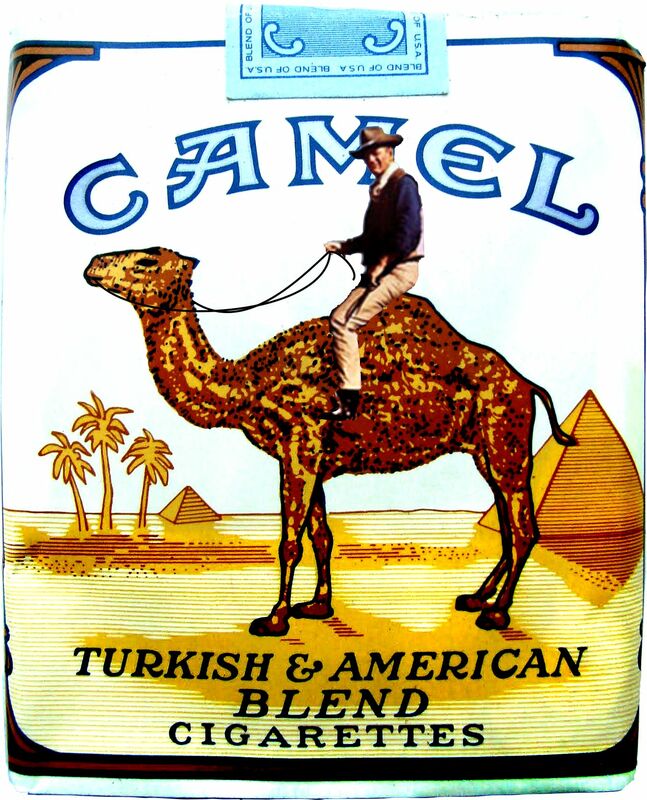 I was a heavy smoker myself for quite a while – 2 packs of Canadian cigarettes a day – 25 cigs per pack. So I have some experience with this thing. When I finally quit, I coughed up tar for 6 months. Smoking is an extremely insidious addiction. Before I started smoking I very rarely caught flu or even a cold. After I started, I caught everything. Smoking seriously damages and devitalizes your whole immune system. Don’t do it. 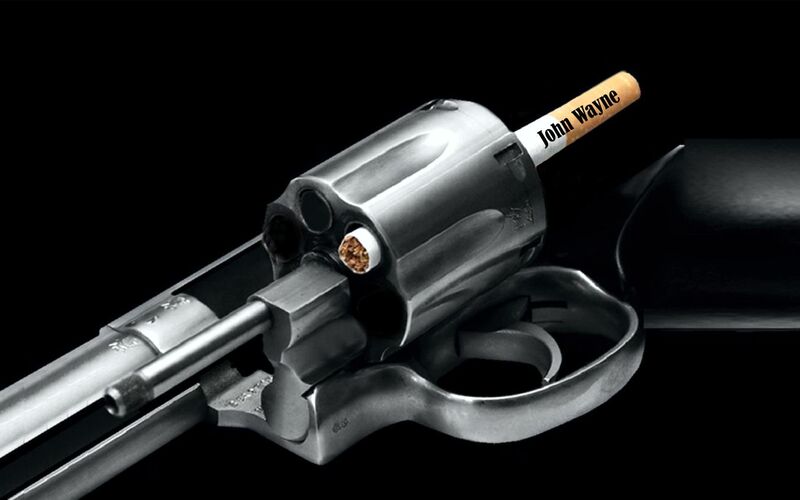 So lets’ see … John smoked 6 packs a day x 20 cigarettes per pack = 120 cigarettes a day. Could you smoke this many cigarettes a day? 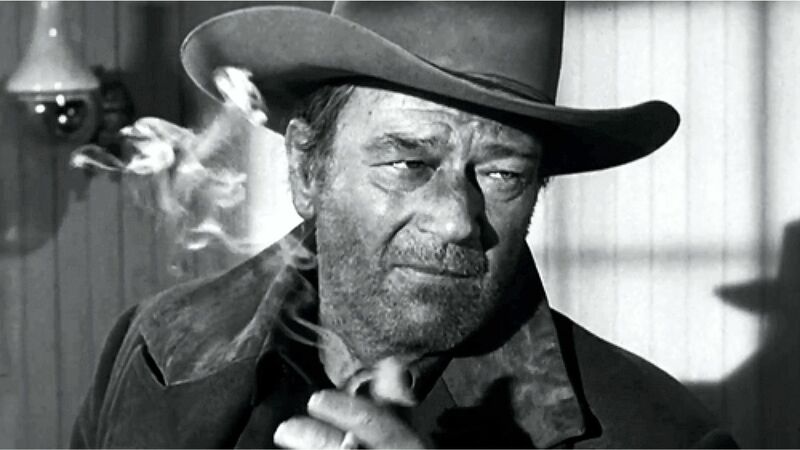 Assuming John Wayne couldn’t smoke while he was asleep (?) and assuming he slept about 8 hours a day, that’s 120 cigarettes divided by 16 hours = he smoked about 7.5 cigs an hour. That’s a lot. But possible. These are all Guesstimates, of course, but you get the picture: John was an outright addict. And even though John grew up in an era where smoking was portrayed as being debonair, sophisticated, suave and ‘cool’, it must have been very difficult to be around him due to this excessive smoking – even if you were a smoker yourself. And I’d guess it would pretty well be impossible for a non-smoker. 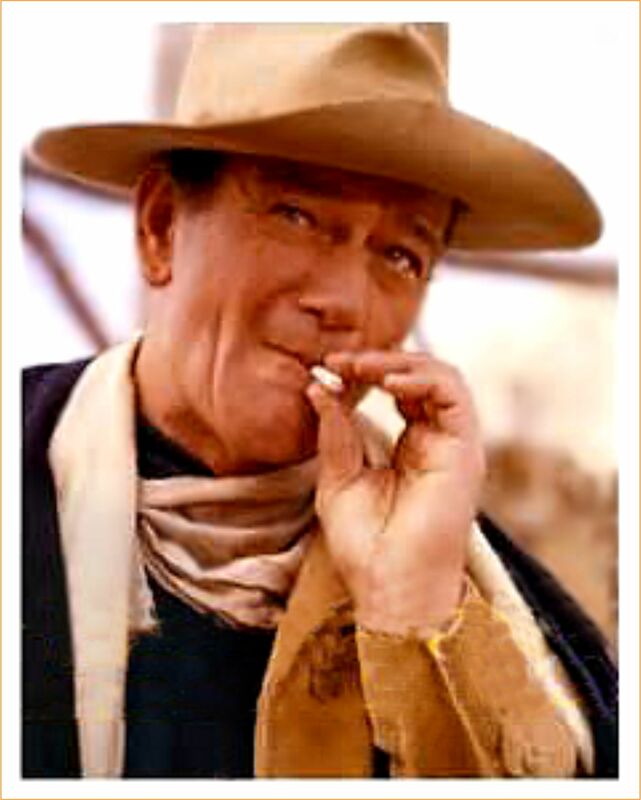 Strangely however, in most of his Westerns, John seems to smoke very little. ? Guns and Booze are plainly evident. But not cigs. ??? But it surely wasn’t hard to catch him smoking ‘off camera’. Yet he rarely brought it to film. And even then, it didn’t seem overdone. 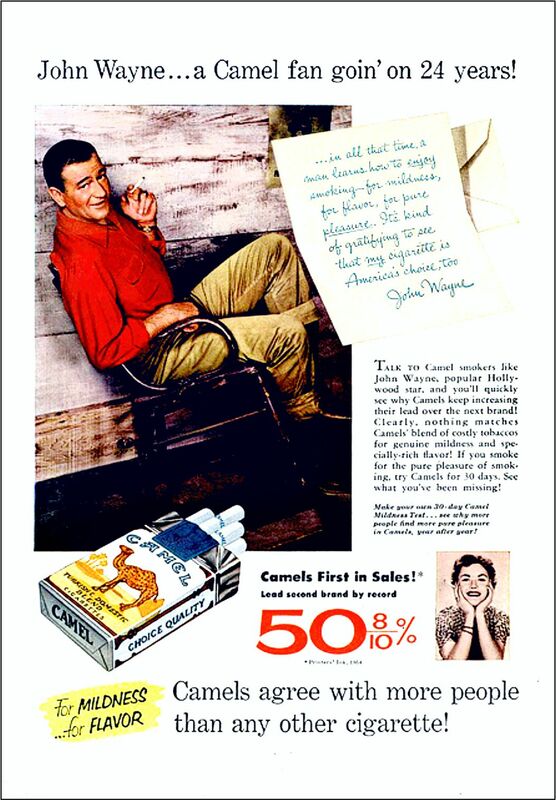 In advertising, John, of course, wasn’t the only celebrity who endorsed smoking. 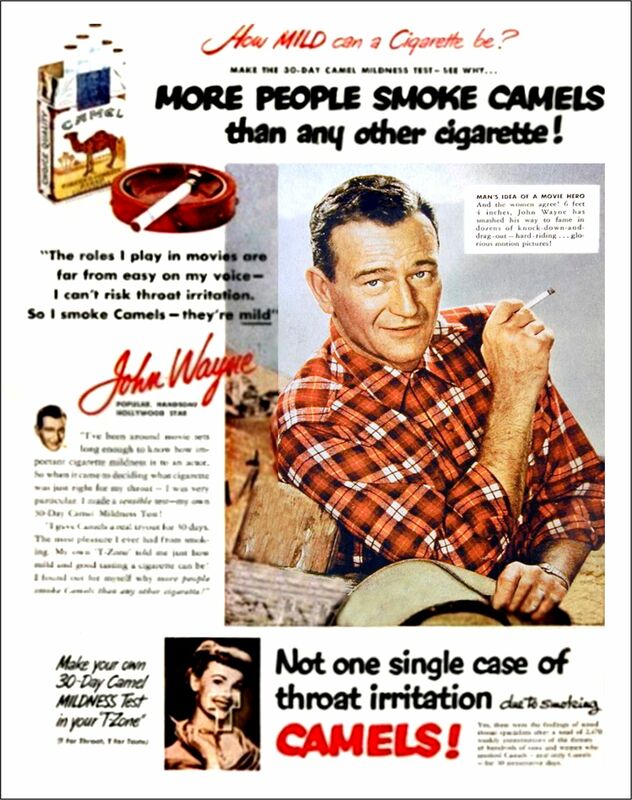 Dozens of Actors, Actresses – and even Athletes and Doctors endorsed smoking in that era. Magazine ads, TV commercials, radio ads, billboards … you name it. There’s controversy over how John ultimately came down with Cancer – due to a film location that had been used for nuclear bomb testing.